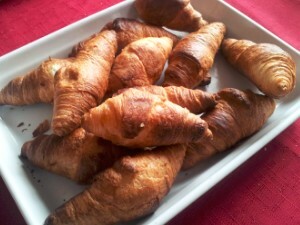 Croissants for breakfast? No problem, all you need to do is buy the frozen ones in the store near you and you'll have them ready in no time. Get a bag of frozen croissants you can probably get in most of the stores with frozen food department. 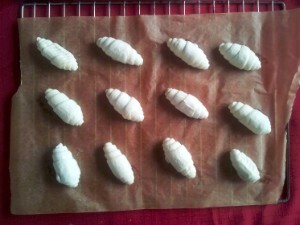 Put some baking paper over the oven grid and then put the frozen croissants on the baking paper. 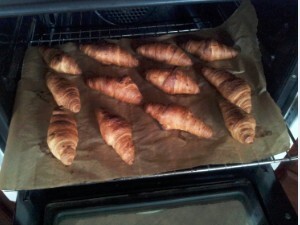 There should be a bit of space between the croissants as they tend to rise as they bake. Leave them rest and melt for about 15 - 20 minutes. Set the oven to 220 C (430 F). 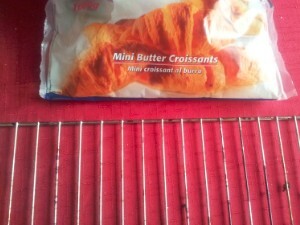 Read the instruction on the bag to set the exactly right temperature for the croissants you bought. After 15 to 20 minutes, put the grid into the oven. 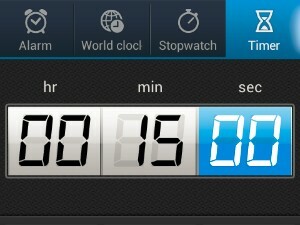 Set the timer to about 15 minutes. Check the bag for the suggested baking time. 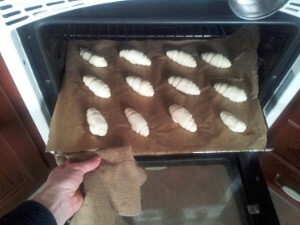 After 7 minutes, check on the croissants on how they are doing. Mine need a few more minutes. 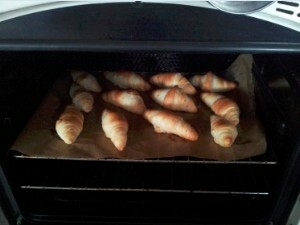 After 15 minutes my croissants were done and ready to be taken out of the oven. Put them onto a plate or basket and let them rest for a minute or two. Enjoy them with jam and butter or simply as they are with a cup of tea or coffee. Potato salad is very tasty and simple to prepare. It is a side dish that goes very good with chicken or fish. I will show you my way of preparing a simple and delicious potato salad. A delicious leek soup, rich in taste and texture, healthy as it can be. Great for cold winter days, you can serve it as a starter or a light main dish. Try it, you won't be sorry. Who doesn't like a pizza. We will make a dough from scratch, prepare the tomato puree and with one step after another make one the best homemade Pizza Margherita you have ever tasted. Don't have bread? No problem, make your own delicious flat bread in under 30 minutes. All you basically need is flour, water, olive oil and a bit of baking powder. Not sure if that really is the correct name of the recipe, but one thing I do know for sure, that this is one delicious way to prepare your potatoes and a great side dish to your meals. If you like asparagus and rice, then you will love your very own home made asparagus risotto. Give it a try, it's so simple and delicious. Yes, just like jj_edwards said. Fast, easy and great for parties.